The trip back was all on the Irish equivalent of an interstate. Just looking at the highway, you could have been stateside, except, of course, the cars driving on the left. The car we rented from Hertz was diesel and got 54 miles/gal. It had a 6 speed gearbox and was very responsive, as good as any gasoline car in the states. There was plenty of room for four and a trunk that too four large suitcases and three carry on bags. One wonders why you can't buy such a car in the U.S. By the way, it didn't smoke or output any soot that we could see. On the way we stopped at a chapel built on a 100 ft high rock. The area was much fought over to secure the high ground around 1000 AD. They are now trying to restore the structure since it was made of sandstone which is being eroded by acid rain. A metal roof was built above the old roof to protect it. 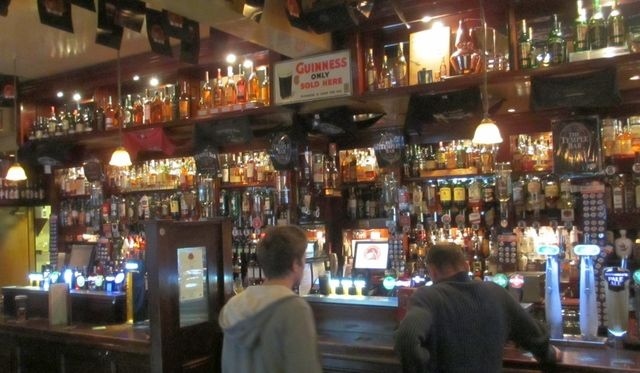 We checked in at our hotel in Dublin and then went looking for pubs. 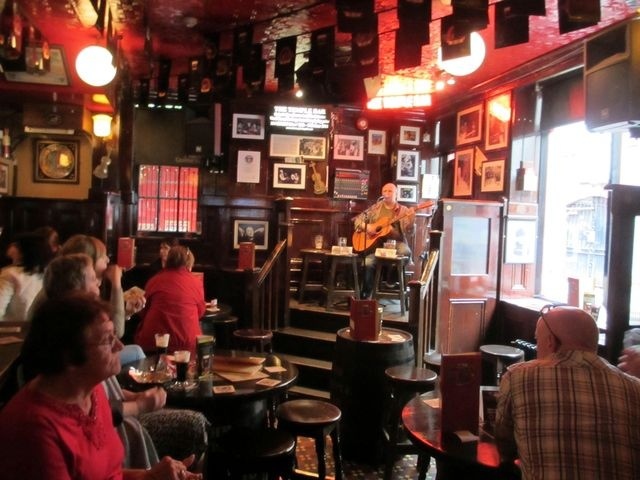 We found the Temple Bar, a pub that actually plays traditional Irish music. 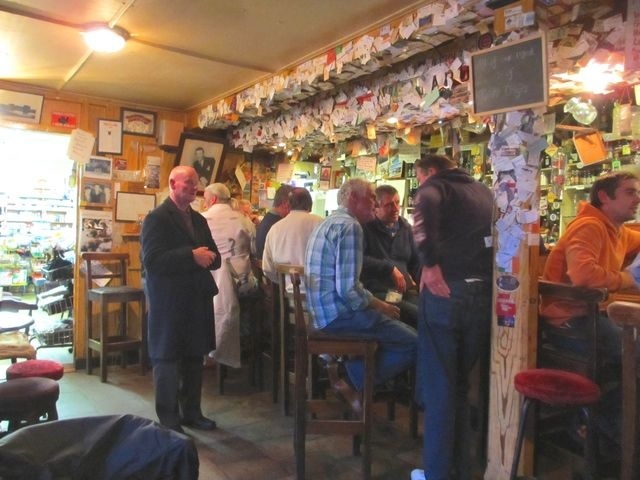 it's loud and crowded, typical of the pubs in Ireland but everyone seemed to be having fun. We leave Dublin at 3:30 pm and arrived at JFK around 6:00 pm, at least that's the plan. It's been a lot of fun exploring Ireland and the people have all been so friendly but it's time to return. We plan on another trip down the ICW starting 9/15 or so depending on the weather and I'll restart the blog then. Leaving Dingle in the morning after another great B&B breakfast, we chose the coastal route to Cork, Ireland. We negotiated two mountain passes along the way where our speed slowed to a crawl. You had to be very careful going around blind curves when the road was essentially one lane and yet had two way traffic. On many of the curves you saw rocks painted bright yellow or white to warn motorists to avoid them. They had obviously been hit multiple times in the past. I'm sure more damage was done to the cars than to the rocks. You'll see several signs warning motorists to stay to the left since visitors from the continent drive on the right side of the road as we do. I saw the driver ahead of me swerve to the right on a tight curve before realizing his mistake and swerving back to the left, narrowly missing on-coming traffic. This was on a mountain road with a sharp drop off on one side and the side of the mountain on the other. We met one car in a tunnel who had to back out, no room for two cars to pass by. However, the scenery was stunning as usual. I lived in Colorado for three years where we had higher mountains but not the profusion of green everywhere. The pasture land didn't come that way, it had to be made. The stones were moved to the sides of a field and stacked to form the "fences" (with gates). Then they had to haul seaweed up the side of the mountain along with sand to form soil. The limestone rich area and 100 inches of rain per year did the rest. 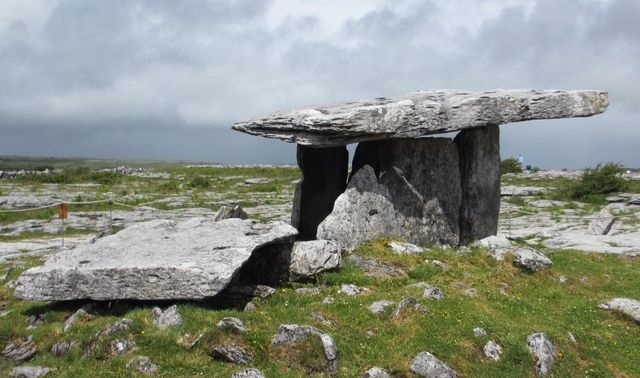 Ireland has their own version of Stonehenge. 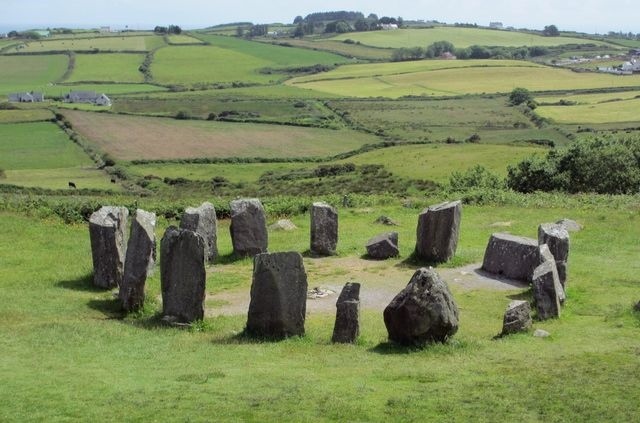 It's called the Drombeg Stone Circle and is a smaller version of its more famous cousin in England. It's been dated to be at least 3000 years old and probably older. It marked the winter solstice where the sun lines up with the stone portals to mark the event. That's when the ancients knew that the days would start getting longer and spring would come once again, pretty important for them. 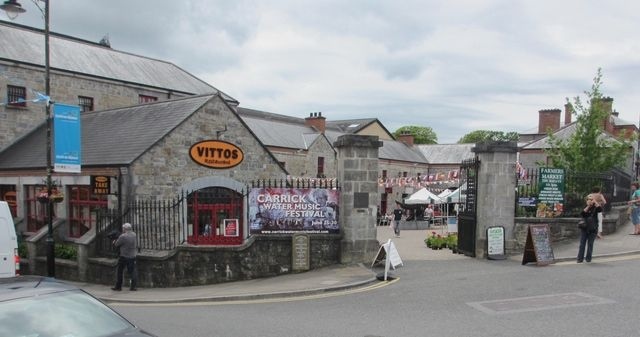 We're just outside Cork for the night at another B&B and we're headed back to Dublin on Tuesday to catch our Wednesday flight back to the states. The high winds certainly did come but the rains held off and we saw periods of sun, good enough for some good photos. 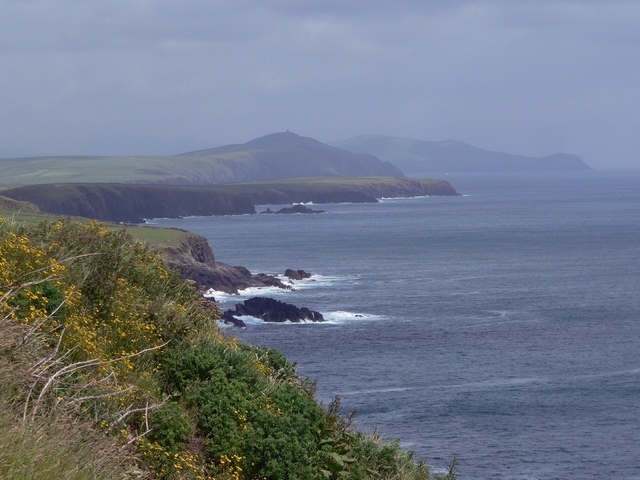 The Dingle Peninsular receives over 100 inches of rain a year, plenty to keep everything green. To put that in perspective, the Brazilian rainforest gets only 83 inches a year! 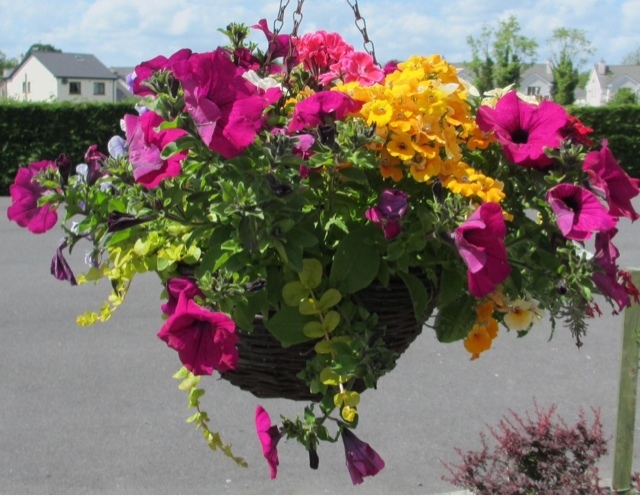 There's a saying in Ireland that there are two kinds of weather in Ireland, raining and about to rain... As for temperature, anything in the 70's here is a heat wave but there's no chance of that until July or August, mostly it's in the 60's, even during those months. Ireland does have some superhighways connecting major cities and we took advantage of them today on our way to Dingle. We went over a mountain pass with a one lane road that had traffic in both directions. If you can see someone coming, you pull over into one of the few wide spots to wait for them to pass. More often than not, you just back up until you find that wide spot backing up on a mountain road with sheer drop offs is exciting. The mountain side is on one side ready to rip into the side of your car if you come too close, a small, loose stone wall is on the other - the only thing between you and a 1000 ft drop! The situation keeps you alert. Despite the challenges in driving, the mountain views are awesome. 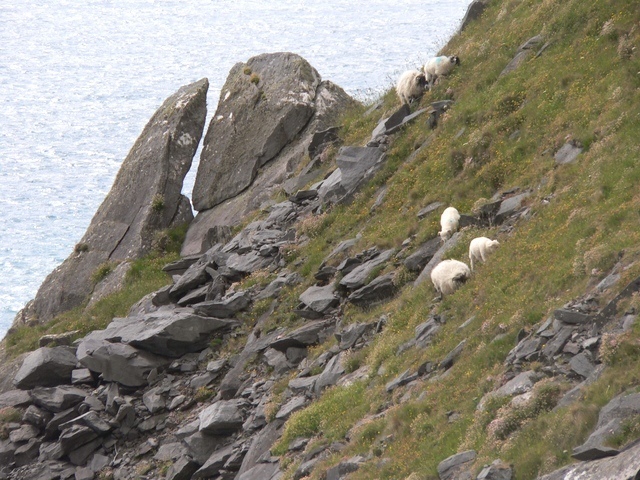 Sheep are all over the mountain sides grazing on what looks like a 60 degree slope. Somehow they don't seem to fall. Walking over to the side of a pullout with a sheer drop off to see the views is also some fun in winds gusting to 40 mph. Still, it's worth every minute. You can see such sights nowhere else in the world. We have found the B&B's to be spotless and the hosts friendly in the extreme. When you walk into one, you're immediately impressed with the decor, the cleanliness, the plantings around the grounds, etc. they bear no resemblance to any hotel you've ever been in, they are unique. Since the B&B's come with breakfast included, we've been skipping lunch, just snacking. the hearty B&B breakfasts are enough to fill you up for most of the say. We've been eating "pub food" in the evening for the last several days (food served in an Irish pub), nothing special but filling and saving our appreciation of good food for breakfast. The weather is supposed to get better, mainly with less wind (there's always a chase of rain). I recovered from my Irish cold but not before I passed it on to Ann, unfortunately. We have two more days of exploring until we return to Dublin on Wednesday. As part of any Bed and Breakfast (B&B), you get a free breakfast included in the price of the room. 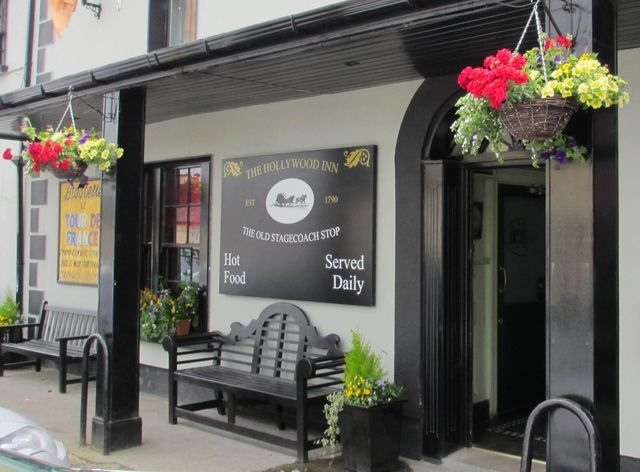 A typical B&B room in our area of Ireland goes for 65 euros ($85) but if you consider the free breakfast it would only be about 50 euros ($65) or less. You get a full breakfast, not a continental breakfast. This morning I had the Irish breakfast of two slices of Canadian bacon, an Irish sausage, an egg served the way you want it, two tomato halves, a brown and white pudding, all served with toast and coffee. It's enough to fill you up. Properly fortified, we headed out into the 40 kt gusts and rain. The rain wasn't continuous, it just came and went throughout the day, an annoyance but not a deterrence. The sun even came out sporadically, enough to take a few pictures of the beautiful countryside. The area was all covered with loose stone, I can't imagine why anyone would want to live there. This is not the household settlement mentioned below but rather a much earlier culture. We saw family settlements dated to 700 AD that were surrounded by stone walls that were dry stacked (no mortar) up to 12 ft high. There were 45,000 such "round forts" at one time in Ireland. It was like a barnyard, about the same size and it kept the household animals in and unwanted animals out. The outside pens were also made of dry stacked stones that look strange to those familiar with stone walls in New England. 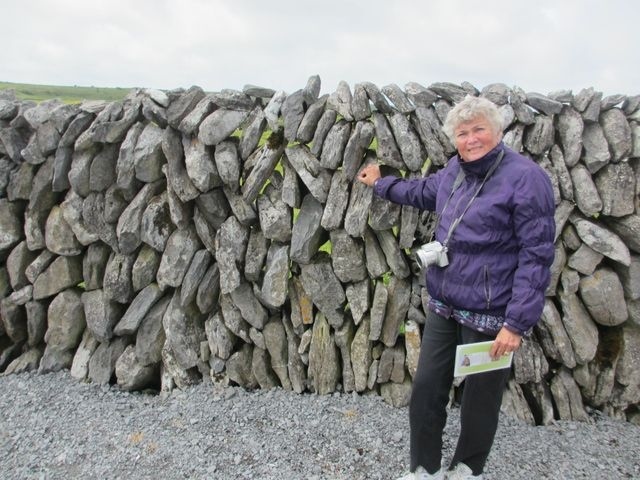 The stones were stacked on edge, not laying flat as in New England stone walls. 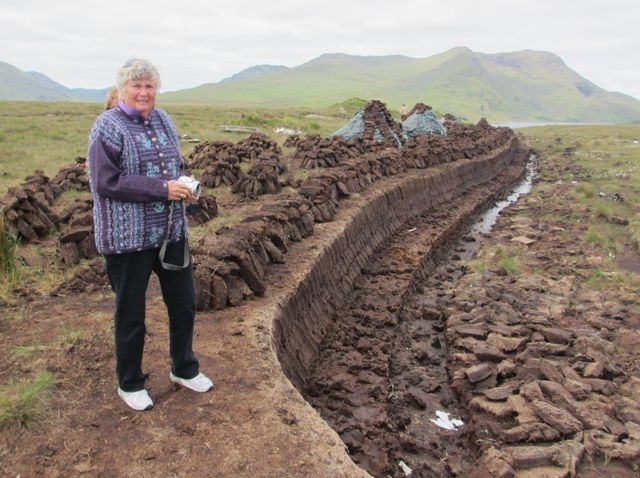 They could get away with that in Ireland since there were no frosts with the associated frost heaves to disturb the wall. At the tippy top you can just barely make out a few dots, those are people on top! At the next stop was one of the most spectacular sights I've ever seen, the Cliffs at Mohar. 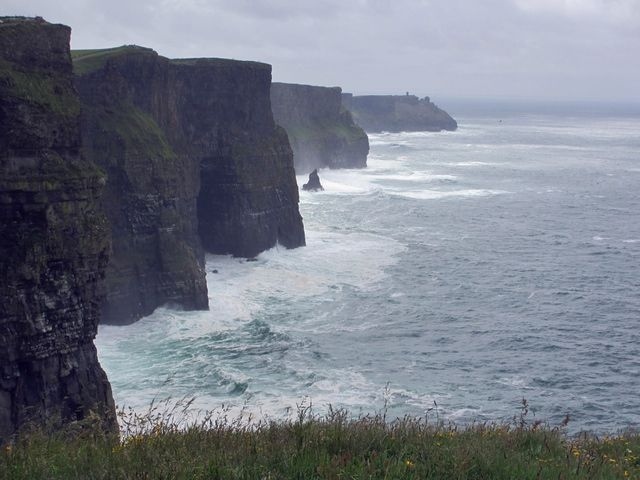 They are located at the Atlantic shore on the western edge of Ireland and they are sheer cliffs of stone that drop straight down to the Atlantic 600 ft below. Photos do not do them justice, they are awe inspiring. 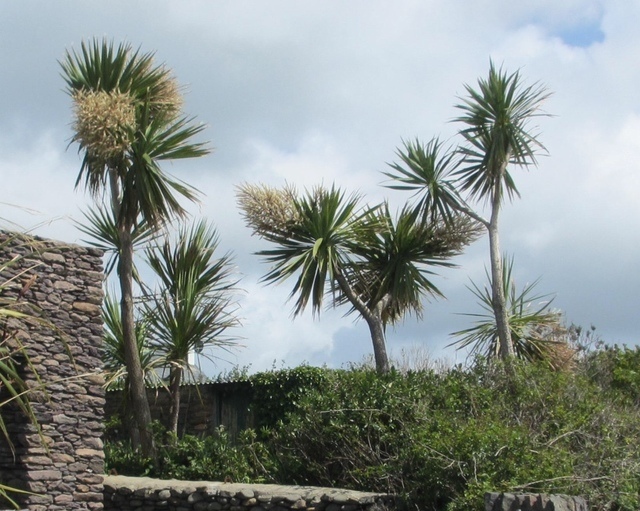 Before they built retaining walls, there were reports of people being blown off by the high winds coming off the Atlantic. How's this for a dry dock? 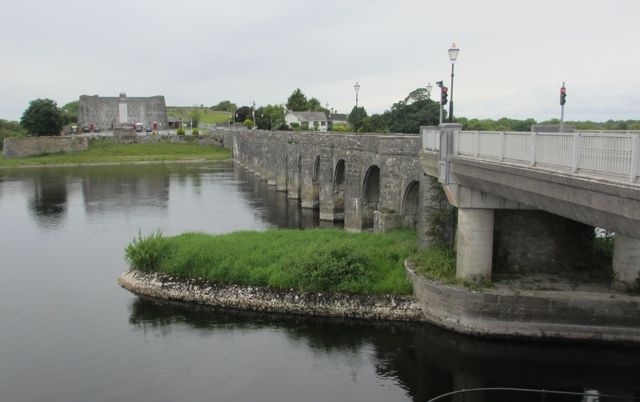 We're now in Ennis on our southern loop back to Dublin by Tuesday. The weather is supposed to improve (ha!) 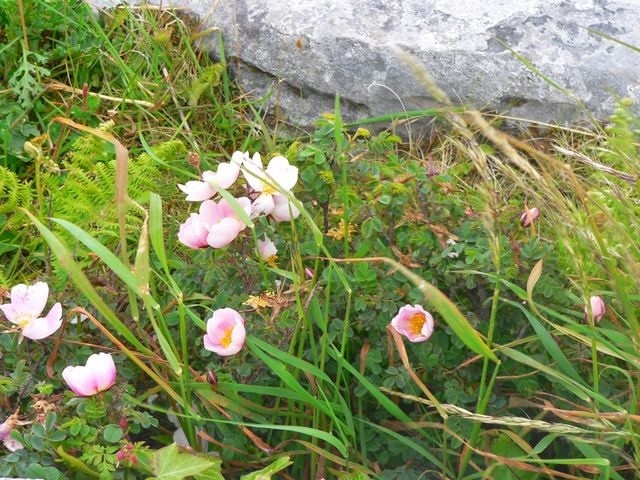 but we're still enjoying ourselves, Ireland is beautiful. A farmhouse with a view. The mountains are green right to the top! 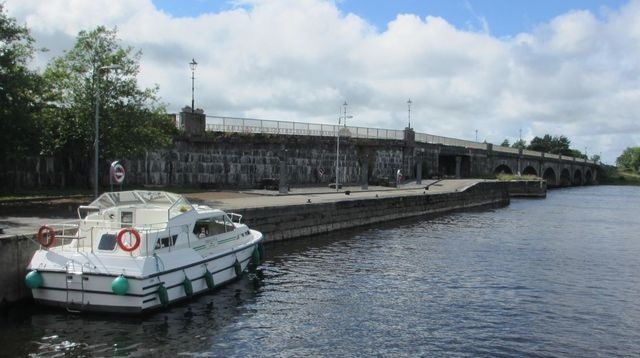 After a brief shower in the morning, the sun came out as we said goodbye to our chartered boat at Carrick-on-Shannon and headed west into the mountains of the Connemara Peninsula. 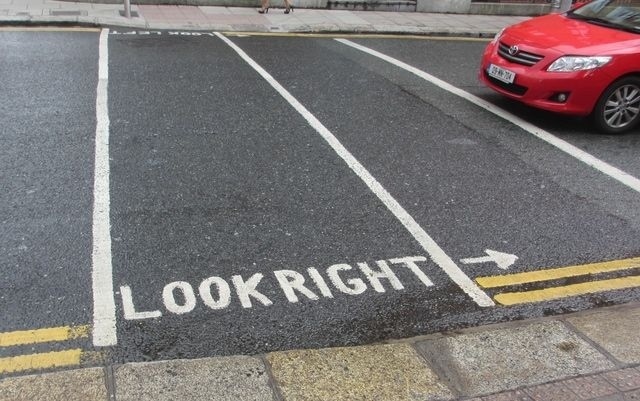 The roads in Ireland vary greatly. You may find yourself on what appears to be a one lane country road except for the white strip down the middle and a speed limit of 100Km/hr (62 m/hr). Where the road ends on the left side is a stone wall and the right side can often be the same or worse. Now, here comes one of the many tour buses in the area with the driver side wheels over the white line, what to do? First you look for any slightly wider spot in the road, a driveway, a place where the wall leans away from the road, anything to help pass by that bus! If you make it, then you can look forward to many more chances of having less than full success. Throw in dozens of blind curves bordered by stone walls and the driving can be interesting. The ultimate insult is when you think you're getting pretty good at passing cars with about 6 inches spare, you'll see a sign with the caption, "Road Narrows". That usually means a truly one lane bridge with stone walls on either side that have obviously been hit in the past. You'll know you're getting the hang of it when your passengers shy away from the wall or light pole on their side of the car that you barely missed by inches. Oh well, it's all part of Ireland. We were blessed with sunshine in the morning on the way to the peninsular. Everywhere you look you'll see green. It's the greenest green you'll ever see. 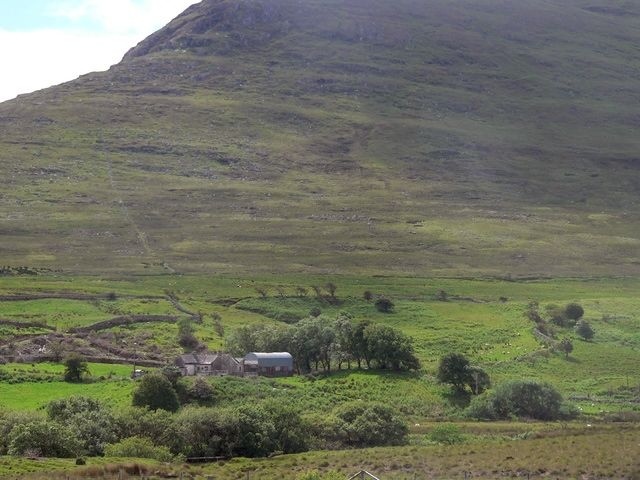 After being in Ireland for a week, you'll know exactly why it's so green - it rains all the time! They don't know what a drought is. They never heard of faucets with 2.5 or 1.5 gal/min limits, the water pour out at firehose strength in the shower stall. The other stunning vista (in addition to green everywhere) are the flowers in all directions. 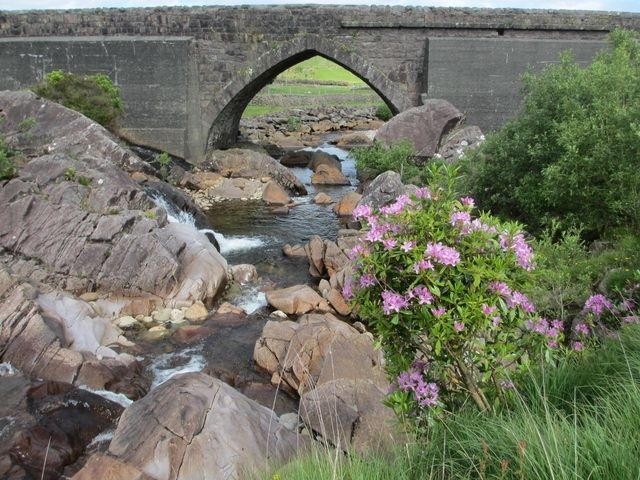 Today it was the rhododendrons, As we headed towards the coast, they were in full bloom, growing wild along the road, in the fields, up the sides of the mountains, everywhere. Just magnificent. We stopped by a peat bog along the way. We had heard of a "quaking bog" so we wanted to try that out. We stood about 10 ft away from Leathen as he jumped up and down. Sure enough, the bog "quaked", strange. When he hit the ground, we were moved upward enough to notice. After we checked into our B & B, we took a ride along the mountain road. 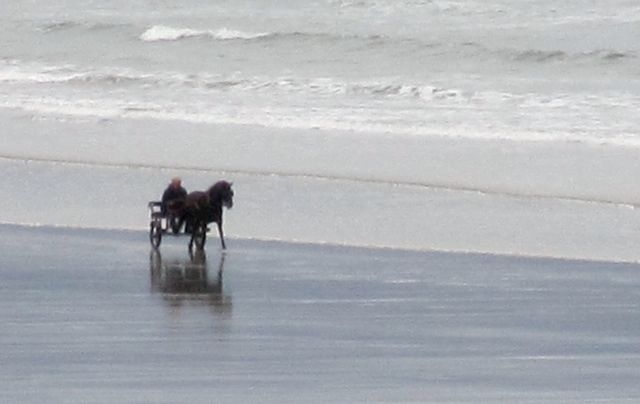 It climbed out of the town, following the side of the mountain towards the Atlantic Ocean. 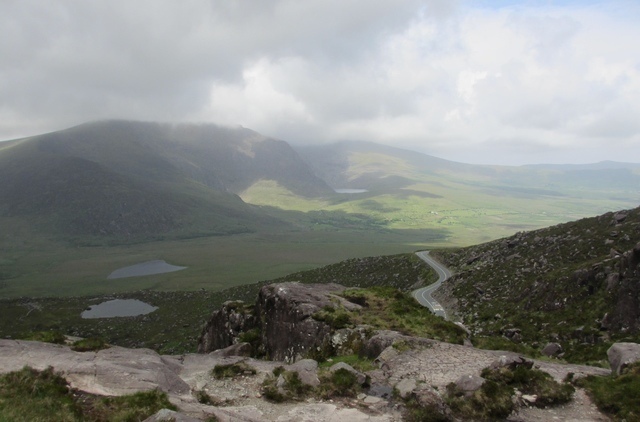 There are no guard rails and the road is just as narrow as any in Ireland. On one side is a 1000 ft drop, on the other side is the rocky cut that comes right to the edge of the road - and it's raining and windy - and there are cars careening down the road towards you. At one point, I stopped to allow an on-coming car to pass and found that two cars behind me took the opportunity to whiz by doing a slalom between me and the on-coming car. Everybody missed, and we continued on our way. Now the weather is not so good for the next few days with winds up to 40 m/hr and a high temp of only 59F. So we'll decide over breakfast how to make the best of it. It is truly a beautiful country when you can see it. 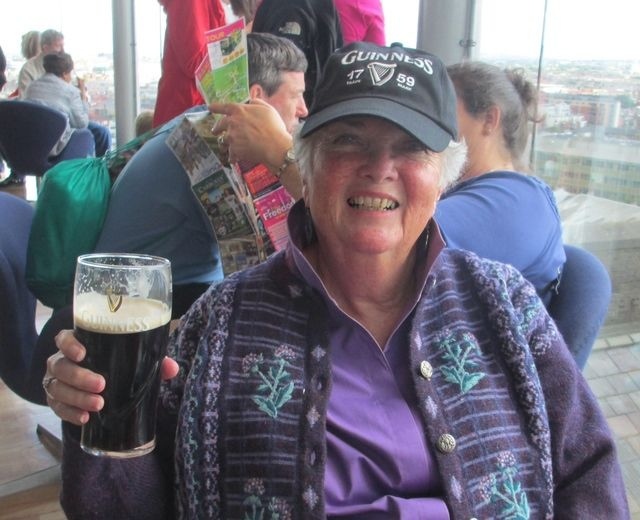 We decided to end our cruise on the River Shannon one day early so we could see parts of Ireland that we would otherwise miss. Today was fine, however, with just a hint of a sprinkle and some sunshine in the afternoon. 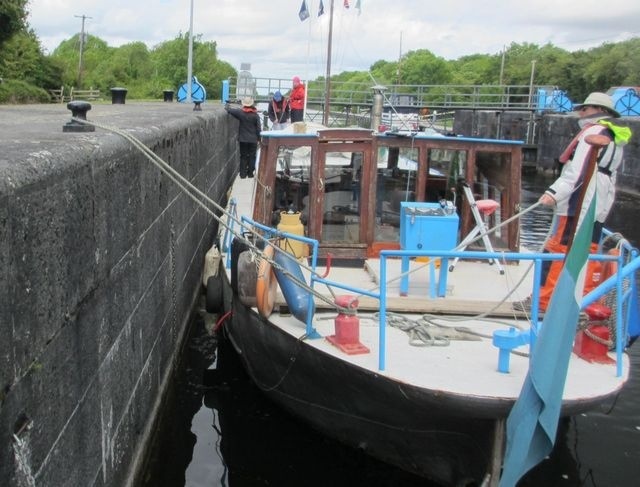 So we went through the last of the locks today and we're currently at the LeBoat base in Carrick-on-Shannon. 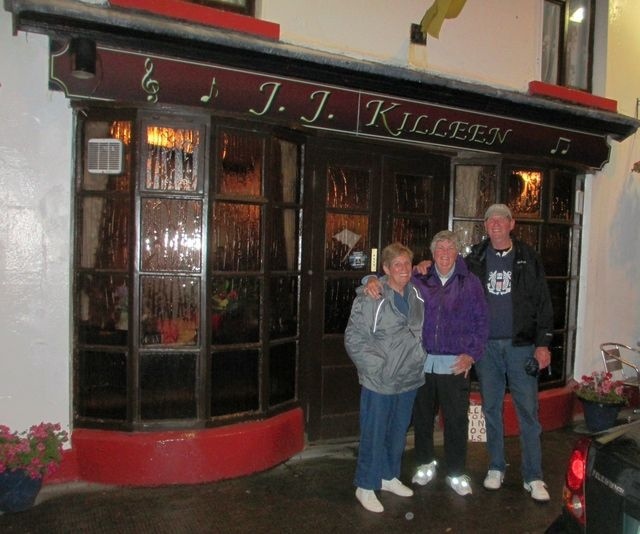 The town here is typical of Ireland with many narrow streets but it's much more crowded. As we were walking around town to see the sights, a lady offered to take our group photo, typical of the friendly people in Ireland. One of the memories we'll take home are how friendly the Irish are to visitors. They've always been polite and eager to help. We'll probably go to a pub tonight but we've all but given up on finding traditional Irish music. Per our experience so far, it's the same music we'd hear at any bar in the states (I know "Ring of Fire" by heart). We headed to the west coast in the morning and then north before returning to Dublin on Wednesday. 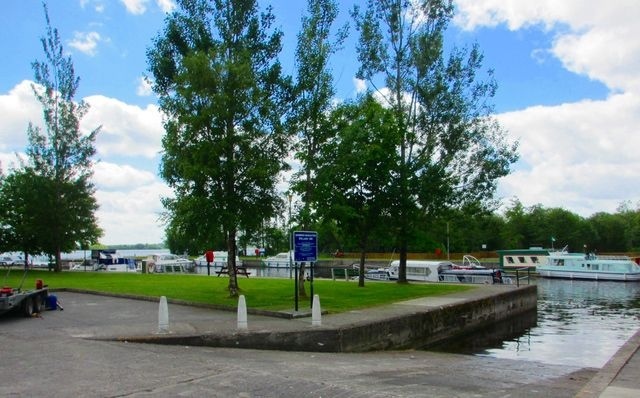 Every town along the River Shannon has a free town dock. It usually tales the form of a harbor built of huge stone blocks. It's always free to tie up to the bulkhead forming the harbor. Water is usually available but if you want electricity, you'll have to pay a fee. 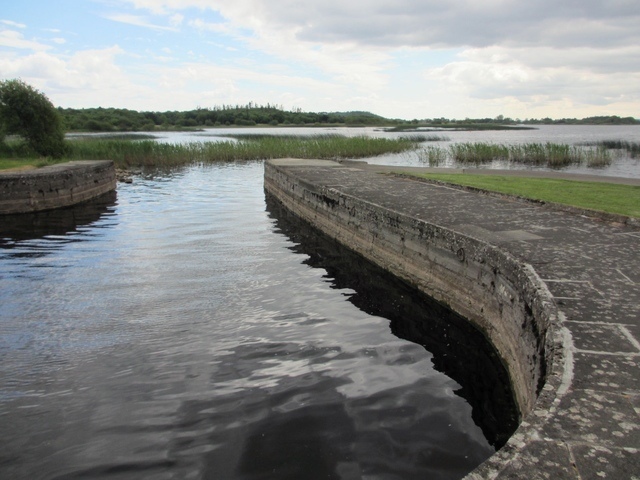 Even towns without the room for a harbor off the river will still have a stone bulkhead by the river for use by boaters. 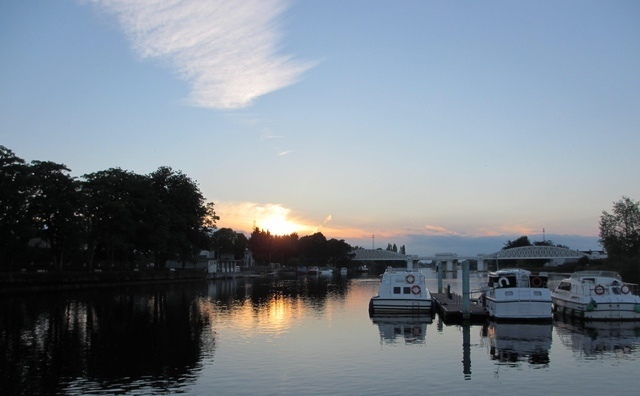 The towns see it as a way of attracting boaters to their restaurants and other businesses in town. I wish the towns on Long Island would use the same logic. We went through two locks today and two bridges that had to be raised. It turned out that the dockmaster was from New Jersey. I think we've met as many people here from the US as natives. Coming into Dromod, the harbor entrance is very narrow. It does a zig-zag at the opening to discourage waves reaching the inner harbor but you have to watch your P's and Q's, there are many of boats in tight quarters close by. This boat is about maneuverable as a bathtub but eventually it's possible to get it turned around and so we are secure for the night. Dromod is the most upscale town we've been inso far. It's a small town but still manages to have two private marinas and dozens of very expensive looking houses. 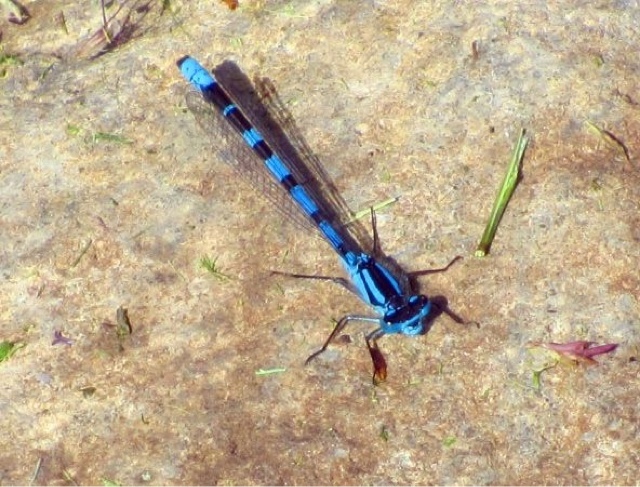 The downtown area is immaculate and has a butterfly garden, nature walks, a forest walk and more. Even with all that, it's apparent that the downturn in the economy has hit the area, about a half dozen shops are shuttered with several for sale. We have reservations tonight at a highly recommended restaurant. So far we've only had one meal that was not so good. The rest have been the equal of what we've had in the best restaurants in the states. On Thursday we plan on making Carrick-on-Shannon, the town where we will drop off the boat and pick up the rental car we left at Portuma. Time to explore parts of Ireland not next to the River Shannon. After the pub night, we moved on to Athlon, a large city by Ireland standards. We walked around and explored but didn't find a lot to do. 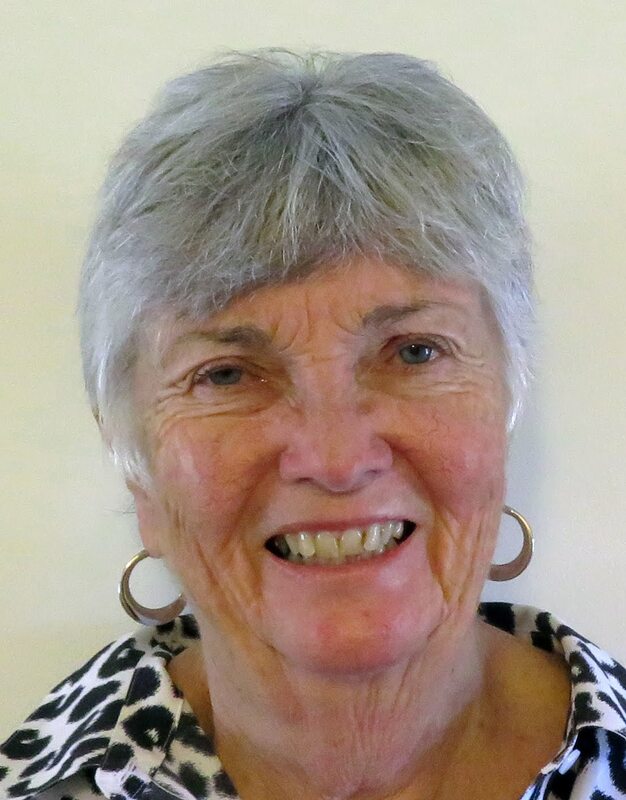 Ann did see a doctor about a minor infection and we wondered about payment. They just give you the bill and then you settle up with your insurance when you return to the states. I think the charge was reasonable, 60 euros ($78) for an office visit with a doctor. The antibiotic was only 9.60 euros. So I'll go after my insurance company in about a week. Just so Ann didn't feel alone, I caught an Irish cold, very miserable. So far, nobody else has come down with it on the boat. On Tuesday we had intended stopping at Lecarrow but to reach the town, you have to negotiate a canal. As we approached the entrance, it looked more and more narrow! There would have been no room to turn around if anotherboat approached in the opposite direction so we chickened out and headed for Lanesborough. This boat we have is impossible in reverse. At last, a sunset in Ireland - that you can actually see! I found a drugstore and picked up some cold medicine but feel miserable. However, today was sunny (!! ), the first one of our stay. We're supposed to have one more sunny day before the weather reverts back to Ireland normal. Everywhere we go, they all say, "You should have been here last week, the weather was beautiful". Now, if only I had a time machine. 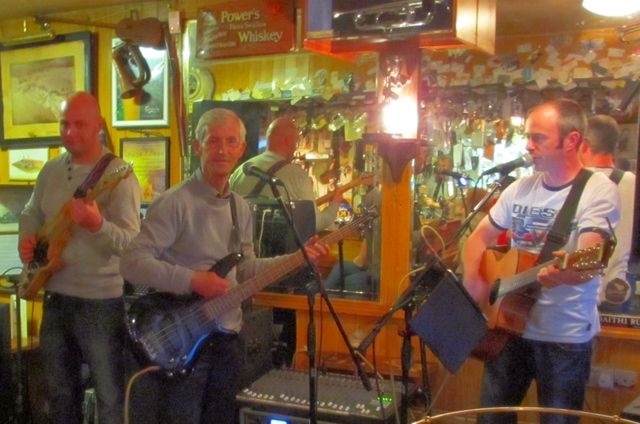 After I finished my blog last night, we headed into town for a pub that had signs out claiming to have live Irish music. It didn't start until 9:30, rather late for us but we persevered.. When we arrived the place was packed. Since I am now drinking Guinness (it grows on you after awhile) I ordered a pint. The town is very small, no tourists in sight except for us. A three piece band arrived, all with guitars and proceeded to warm up, rather loudly. The big surprise, at least to us, was that the music was instantly recognizable, it was music you would hear in any bar in the US! One of the selections was Johnny Cash's Ring of Fire, a selection you will always hear at least once a night in any bar at Key West. The band was playing what the customers wanted to hear, not what the tourists (us) thought they ought to play. Next door to the pub, a store with everything! Oh well, the bar itself had a lot of character. Leathen struck up a conversation with several patrons at the bar (his last name is Mehaffey and he looks Irish) which we watched from our table. The main thrust of the conversation was trying to get him in trouble with his wife (e.g., promising that she would sing along or, better yet, do a solo). They did not succeed but fun was had by all. 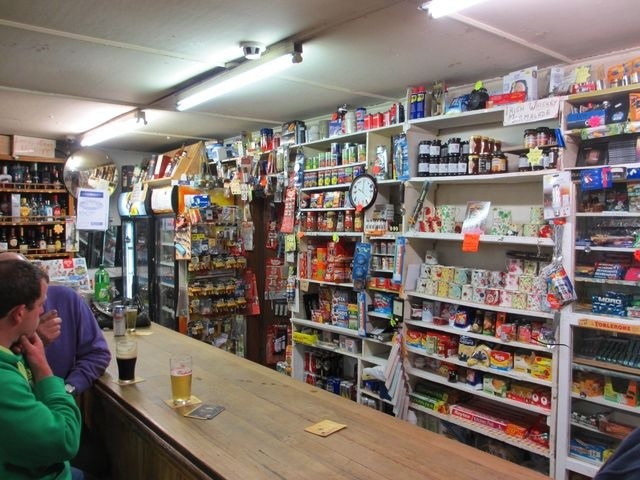 The bar was part of the local general store that literally had everything that any Irish family could possibly want. The selection was enormous although not in quantity for any one item, the photo shows about 1/4th of the store. When we left, the patrons were still going strong. We were told that the Irish generally got up later but then stayed up longer than anyone else, we had no argument with that statement. We will continue our northward trek Tuesday and try to find an Irish bar that actually plays real Irish music! We saw a better view of the countryside today. 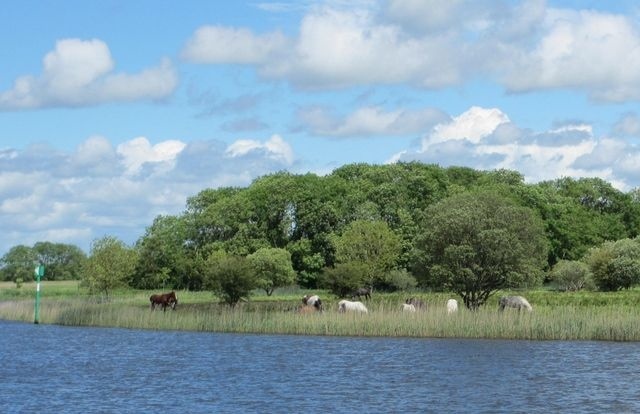 Lots of rolling hills, lush pastures, grazing animals and even a few fisherman. Except for the design of the houses, parts of the land close to the River Shannon could pass for Dutchess county farmland. One major difference however is in the temperatures (50's and 60's year round) and rain. We haven't had a rain free day yet. The weather forecast always reads the same, showers with highs in the 60's for the next three days, then clearing with sun. The next day it's the same, the day with sun is always the fourth day out! It's been like that for the past two weeks, you think it'll get better in a few days but it ever does. We wear a light jacket with a sweatshirt underneath while topside steering the boat, the showers never last longer than a few minutes. We do have the option of steering below, inside the boat but the view is not as good. 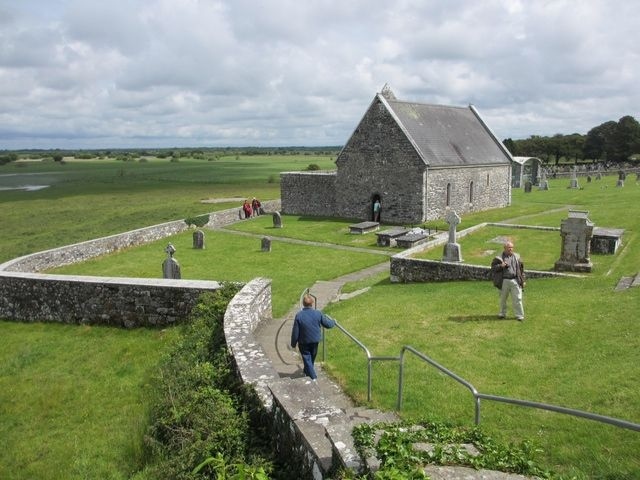 Our first stop was at Clonmacnoise, a 6th century monastic settlement. 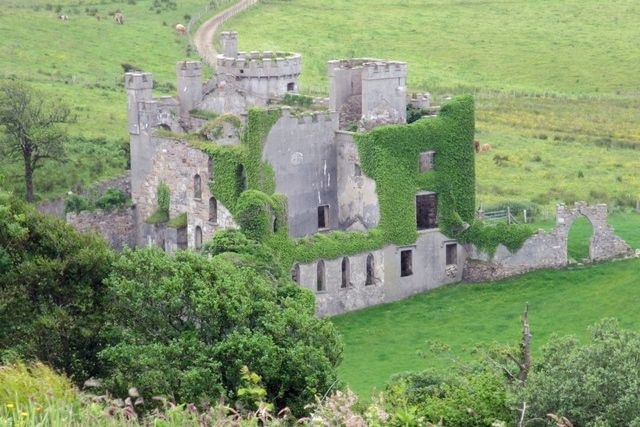 It had to contend with the Viking raiders, other Irish in the area and the last straw was a visit from the English who stole everything, even the glass out of the windows. It's a wonder there's anything left. It seems so much easier to plunder and destroy than build, too bad. 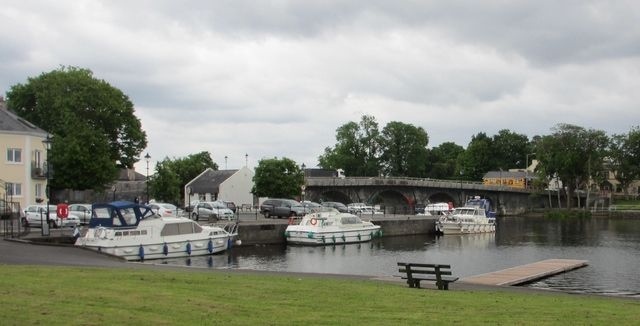 Our last stop was at Shannonbridge. The English built a fort here in the expectation that Napoleon was going to invade from the west (they were friendly to Napoleon) and march on Dublin. As it turned out, the invasion never happened and now there's a tourist attraction, the completed fort. There's a pub in town that's been in continuous use since 1800 so we plan on having a pint to celebrate (don't know just what we're celebrating but we'll find something, no problem after some Guinness. We arrived at LeBoat around 10:00, dropped off our luggage and went in search of a supermarket. Much to our surprise, we actually found one, SuperVal. 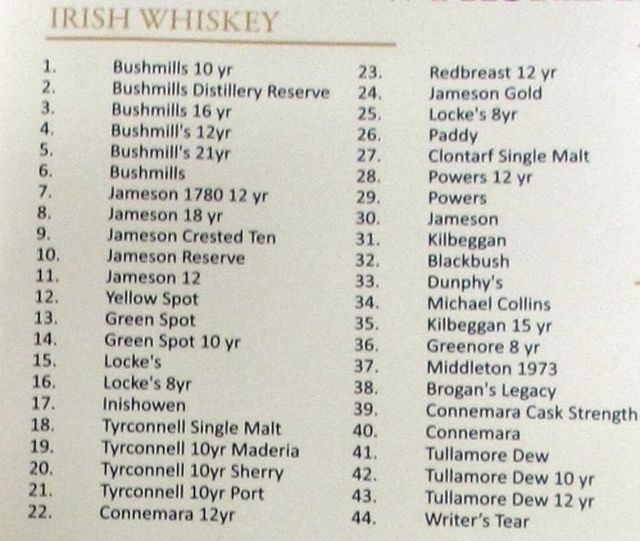 It's a chain in Ireland and it's as good as the average supermarket in the states. 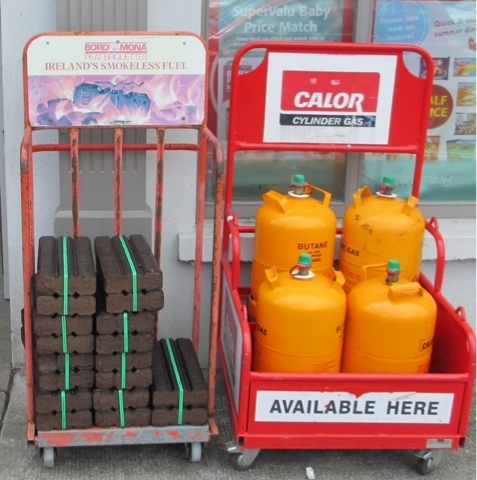 One thing we're always happy to find in our travels to faraway places is a store for provisioning. So, fully stocked we headed out. As I eased the canal boat out of the slip and started the right angle turn for the river, one of the LeBoat staff came running out waving a piece of paper - seems like he neglected part of the paperwork and wanted us to initial something so I stopped the boat, causing it to drift sideways in the channel. 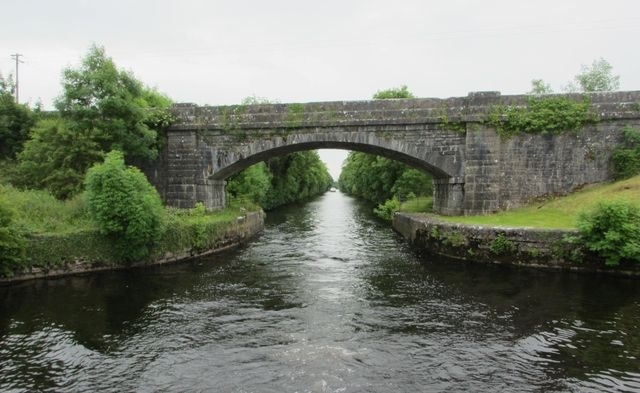 As we drifted around in the narrow channel, fending off, we finally got underway and successfully avoided other boats and the shore on the way to the River Shannon whew! 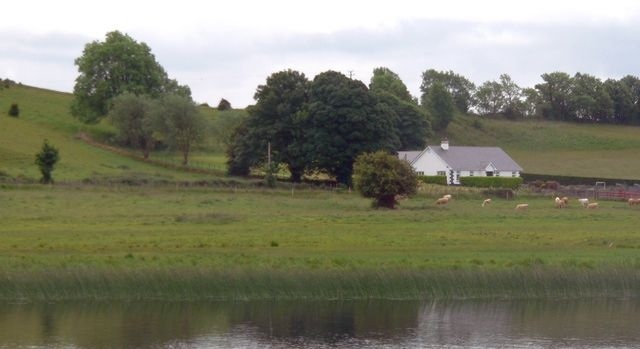 The area by the River Shannon is very pastoral. 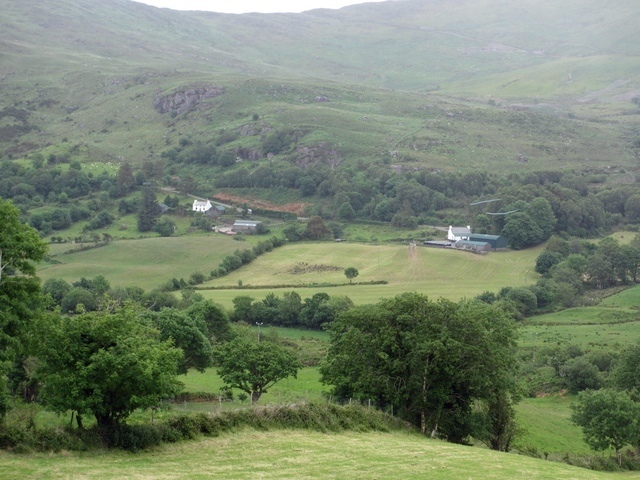 Of course, it's as green as green can be and there's horses, cattle, goats, sheep grazing by the side of the river. The channel is well marked so there's no problem with navigation. We have no depth sounder, no wind indicator, no VHF but we do have a telephone provided by the company to call back in case of trouble. As in our trip to France, there are locks to negotiate as you go upstream. The locks were just like the ones on the ICW, no problem. We did find that our shallow draft powerboat is much more susceptible to wind than the sailboats we're used to handling. We became cross-ways to the current as we slowed down for a boat in front of us going into the lock. These boats are like bumper cars. There are fenders that are permanently attached all around the boat. You can't go wrong. About the only thing you can do wrong is ground the boat. If you do, then there's a 100 euro fee to get pulled off. SeaTow doesn't operate over here! 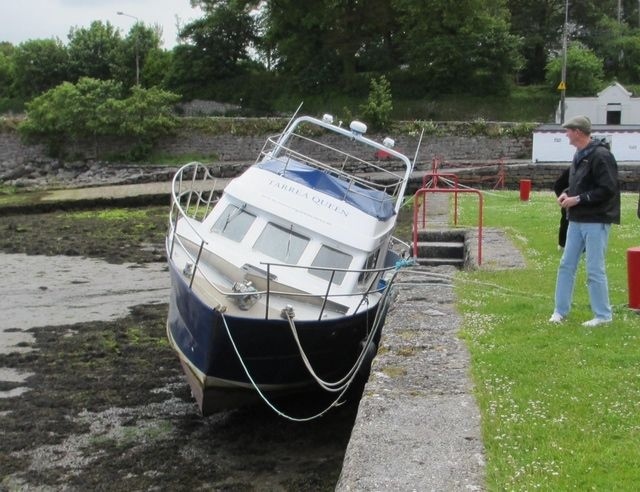 We moored against a bulkhead in Banagher which was provided by the town at no charge, first come, first served. At least that much is free. 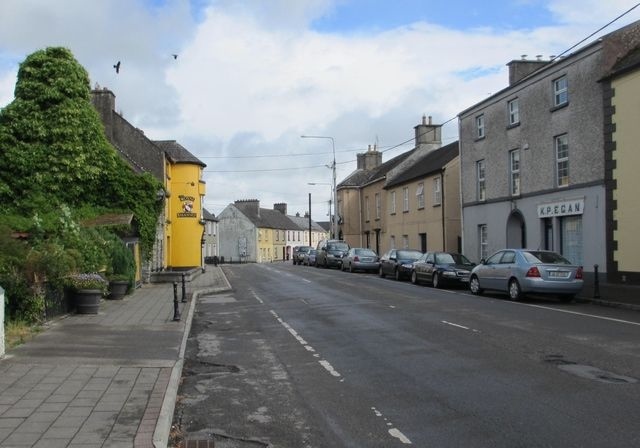 The town is typical of many in Ireland with narrow streets and buildings forming a wall next to the street. We're off tomorrow heading north again to see a monastery by the river. Time to leave Dublin so after having breakfast at our favorite place next door, Queen of Tarts - we loaded the car and off we went. Driving in downtown Dublin is always an adventure, especially on the wrong side of the road but we made it out successfully. The roads in Ireland are typical of many in Europe, very narrow and occasionally, you have to pull over to make enough room for a tour bus or truck to pass. 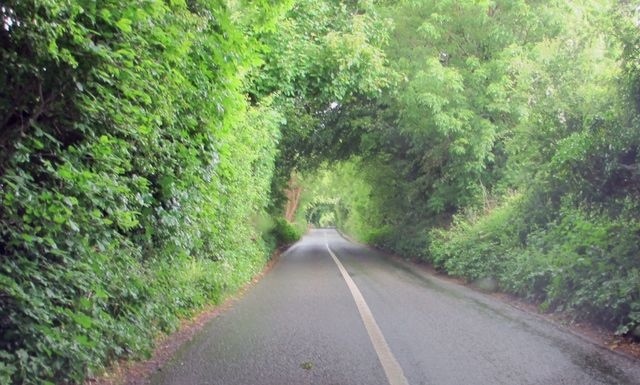 There are sections of the road where the trees are so thick they form a tunnel for the car, strange to be traveling along and suddenly find yourself in a green tunnel! 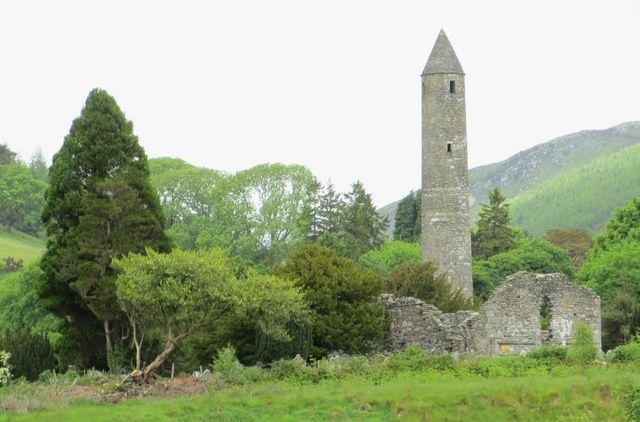 Our first stop was at Glendalough, a monastic village dating to 1050. 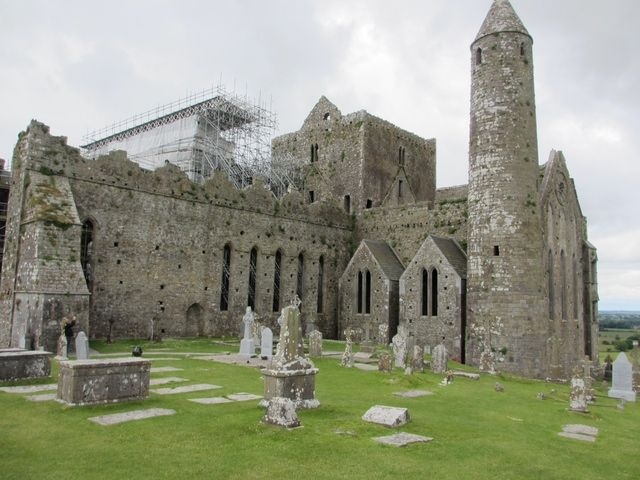 It was home to monks who spread Christianity throughout Ireland from here and other villages like it all over Ireland. The showpiece was a 110 ft bell tower and was surrounded by several churches. It was interesting to listen to the speaker on how life was back then. Many of the headstones showed age at death in the 30's for the most part. It was a tough life. 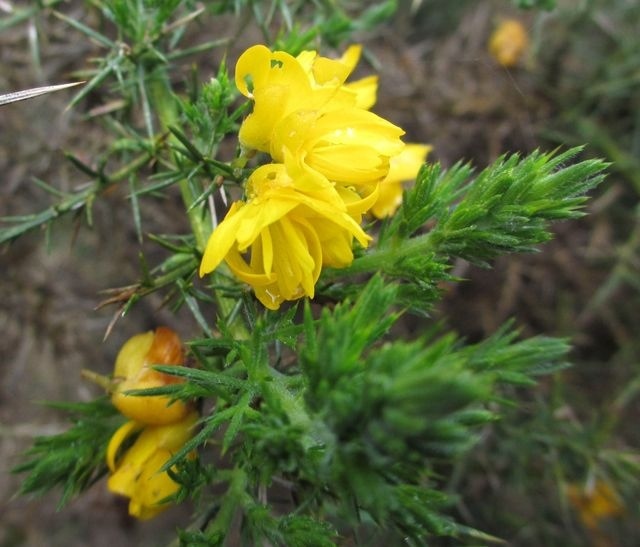 Driving onward through the countryside, one saw many fields of a yellow blooming flower. 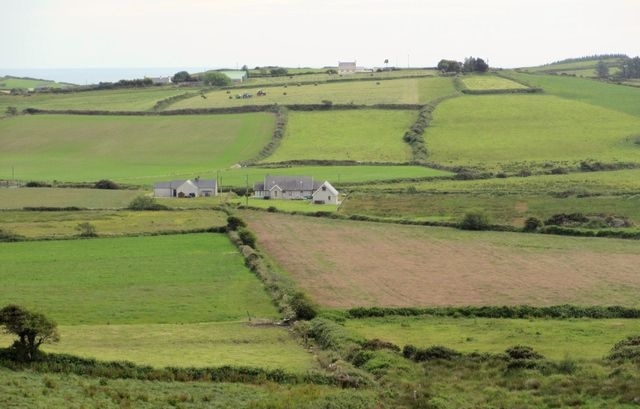 We certainly understand why Ireland is so green - it rains everyday, usually not a lot but there are typically a dozen times a day when rain will descend from the heavens, briefly, not long but always there. We stopped for lunch at Hollywood. Yes, that's right, it's spelled the same was as the Hollywood in California. They claim that they are the real Hollywood and have been for over 1000 years! In fact, one of their former residents moved to Los Angles and named a suburb after his home town - and so that's where Hollywood got its name (at least that's what they say). I must admit that the food in Ireland has been much better than I had expected. So far we've sampled their fish and chips, beef stew, goat cheese salad, scone - and they've all been excellent. In fact, we're probably gaining weight, especially after this morning's helping of Irish oatmeal, talk about hearty. We're headed for our boat on Saturday morning and then we'll provision for the next week. We're more than a little concerned about the weather. It's been cold and rainy so far with temps only in the lower 60's with lots of rain showers with very little sun. On top of that, high winds are predicted for the next few days, up to 40 mph gusts! Hope it calms down. 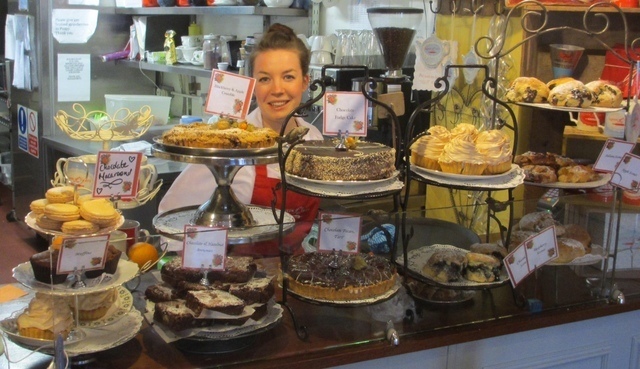 We started out at a great local restaurant that baked everything themselves. Even their orange juice was squeezed in the restaurant from oranges in a basket right in front of the counter. 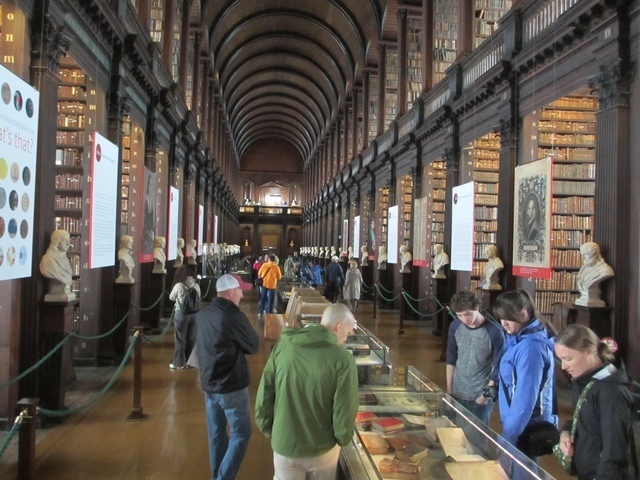 Then it was off to see the Book of Kells, a very famous manuscript over 1000 years old. No photos were allowed, the light was very subdued to protect the hand scribed pages. Monks had painstakingly copied the first four books of the bible with lavish illustrations. Onward to the Museum of Archeology that contained the earliest evidence of mankind on Ireland. The artifacts dated to over 5000 years ago and there some evidence based on two samples that even earlier dates were possible, one artifact was claimed to be over 300,000 years old (no, that's not too many zeros, they really claimed 300,000 years). With the later objects of gold neck pieces, bracelets, there was a lot of wow factor in there. We had purchased a tour bus ticket that was good for 2 days with unlimited on/off boarding, very handy for exploring Dublin. Now it was time to see what Guinness had to offer. 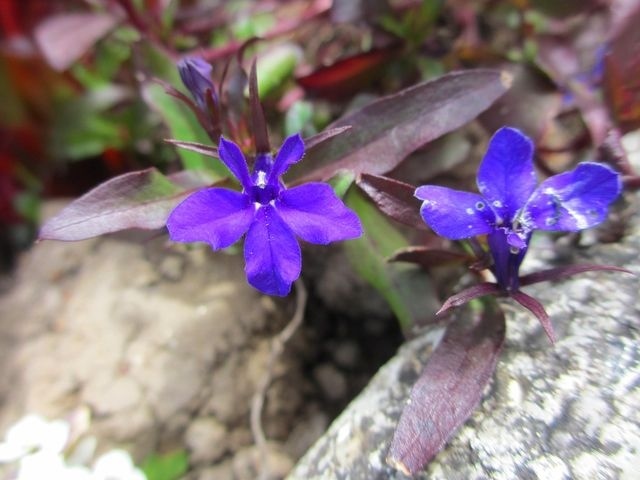 Their home plant is in Dublin and they offer tours along with a pint of Guinness, how could we resist? We had heard that the Guinness you got in Dublin was better than the US due to being much fresher. I'm not an expert on beer so I couldn't say but it did taste good. cars drive on the left side of the road! All during the day we got typical Ireland weather, rain, sun, rain, sun, rain, sun, etc. We carried an umbrella, part of the uniform there. You just never know what to expect, wonder what will happen when we reach our canal boat on Saturday? So, putting all that aside, we had our departing dinner at a superb restaurant down the street. Who said you couldn't get good meals in Ireland? The cost was reasonable at 14 euros for the entree. On Friday we're headed for a town close to our boat pickup point so we can easily provision before setting out Saturday morning. 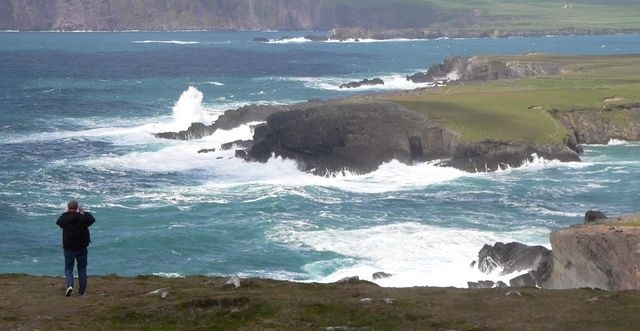 The winds are howling here with 20 to 30 kt winds and gusts to 40, hopefully they will calm down some by the weekend.